This was under the cateogry: A book someone says "Changed Their Life"
This is the story written from the point of view of the author - who was a journalist on the scene the day the shooters attacked Columbine high school. He spent 10 years going through 1000's of pages of notes, interviews, videos, and talking with the families and victims. He spoke to the families of the killers. He wanted to bring out the truth and debunk some of the mysteries behind "why" the boys killed their classmates, and what happened to the victims who survived. This was a great story. For me - I remember the shooting - it was the worse school shooting in history at the time. 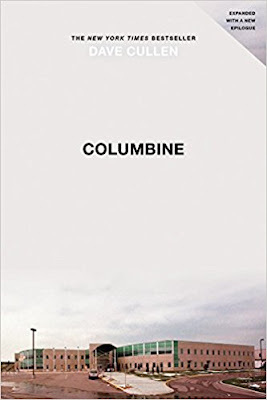 Now, 18 years later, you mention Columbine and everyone knows what you mean. There were things that I believe about the stories the media told that were not true. It was well worth the read. I learned a lot about the killers and their motives and it opened my eyes to how easily warning signs can be missed or overlooked when they are spread out to lots of people. It made me angry that a family that reported the criminal behaviors of one of the killers no less than 14 times to the police and they were almost always ignored. You wonder if the whole tragedy could have been avoided if the police would have followed up and put the killers in juvenile hall. Check out the book. I guarantee you will learn things that you thought you knew about the situation were not what they seemed.